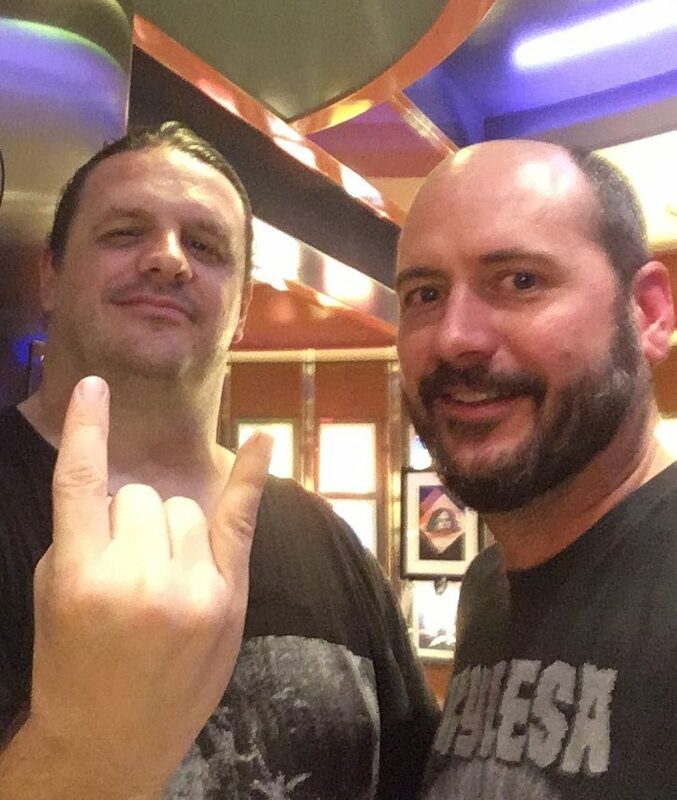 For those walking around the Independence of the Seas over the course of this year’s 70,000 Tons of Metal cruise, one thing as for certain – encountering Mikael Stanne. 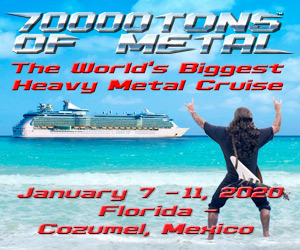 The affable, ever-smiling frontman for Dark Tranquillity could be seen taking in shows, grabbing a bite at the buffet, having a drink in the lounge, and soaking up the energy of the cruise ship and the 3,000 rabid fans that set sail on what has become an epic pilgrimage for many. “Good morning, Mikael. How are you doing?” I asked as he walked past following breakfast in the Windjammer Café. “A little hungover, but great!” he responded, clad in his trademark black jeans, jacket, and t-shirt, his red hair and warm smile emanating a comfortable confidence that has become his hallmark. And interactions like this were typical over the course of the five-day adventure. For a band that have defined the Gothenberg sound and have been playing together for more than 25 years, this elder statesman has youthful exuberance that is infectious. When he and I sat down for a conversation in one of the press cabins, this excitement – both about being on the cruise for the third time and playing with his mates in Dark Tranquillity – were on full display. What is it that keeps you coming back to the cruise? It’s crazy. There’s such a passion. Not everybody can do this, you know? Travel from the other side of the globe just to get to this crazy cruise, so you only really get the most dedicated, insane festival freaks, which is amazing. And it’s also great to hang out with a lot of friends from bands. We have also met so many people the two times that we have been on this cruise. So many great friends and people that we have been in contact with ever since, it becomes somewhat of a family which is really, really cool. It’s interesting because a lot of the people that I have met, as fans, have been on it multiple times, so it is like it is somewhat of a tribe. It really is. We see it when we play shows in America, and people show up with 70K t-shirts … it becomes something really special. It is an experience you will never forget. Thinking about the band itself, Atoma was released a couple of years ago. Are there plans in the near future for writing, recording, taking the next step? We have to tour a whole lot more first. It’s going to be another year of touring. We have a European tour a month from now, then we do another U.S. tour, and we have festivals this summer. So, yeah, come winter, we will be ready to kind of try some new stuff and start thinking about what to do next. Last night, you got on stage with Insomnium (to play “Weather the Storm”), which was one of my favorite moments of the cruise so far. How did that come about? I sing on that song on their album (2011’s One for Sorrow), so whenever we have the chance, we do it … and we have done it a few festivals and a few shows, you know, whenever our paths cross. It’s always fun. We kind of discussed it, like “When are we going to do it,” and I was like, “Please don’t do it your second show,” which is like at 2 o’clock at night, so I was really happy that it was this early. And it was fun, it was amazing. And such a cool stage … I hadn’t seen that one before. Amazing vibe. One of the things that has been on my mind over the last couple of weeks and leading into the tour is that Slayer is retiring, and a lot of bands that have been around a long time are finally deciding to hang it up, for whatever reasons. Ya’ll have are a seminal band and have been playing for years, so I have to ask, how much more gas is in the tank for Dark Tranquillity? I don’t know, like, especially the last year or so, since Atoma came out, things have been fairly turbulent in the band given that some members have left, and Niklas (Sundin) has taken some time off to tour, so we have had to recruit new members into the band to fill those spots. At first, it was very strange to us since we have been the same kind of guys since the beginning, basically. But that has proven to be fantastic and something that is really kind of energizing us and makes us perform even better. So Johan Reinholdz and Chris Amott are incredible, and they bring so much attitude and presence to the shows that it feels fresh for me and fresh for us to perform again. Playing some old songs with new guitarists, it’s amazing, you know. As long as we still enjoy it, we are definitely going to do it. The way I see it, it just keeps getting better, With every tour, we improve as a band, and normally what we see is growth in the audience, and it just becomes better. Dark Tranquillity will kick off their European tour on Thursday, March 22, at Kulturbolaget in Malmö, Sweden. Following festival season, the band will return to the U.S. for a co-headlining tour with Amorphis this fall. In the meantime, check out Jason Carlson‘s photo galleries of Dark Tranquillity on 70,000 Tons of Metal here. Videos courtesy of Anthony Serafino III.